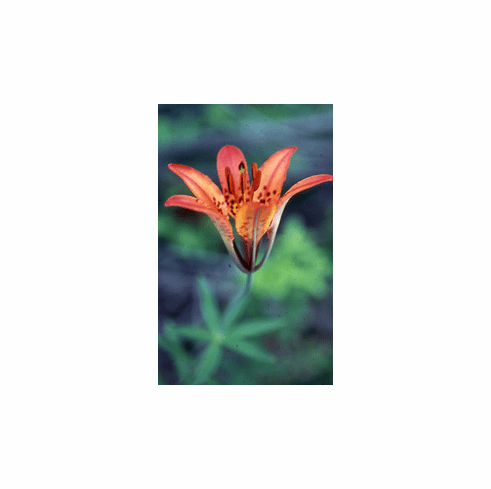 With a wide range throughout southern Canada, the Midwest and as far south as New Mexico, the 'Wood Lily' is found growing near deciduous trees in free draining sandy loam. Difficult in the garden, winter protection from rain is required to succeed. The upright flowers vary greatly in color but are generally orange to red with black spotted yellow centers. This can be a very challenging lily. Title photo, seed grown by Bob Gibson. Photo inset taken by R. T. Hawke in natural habitat, Divide County, North Dakota. Source CalPhotos. Copyright R. T. Hawke, all rights reserved. Used with permission. This image has a Creative Commons Attribution-NonCommercial 3.0 (CC BY-NC 3.0) license.